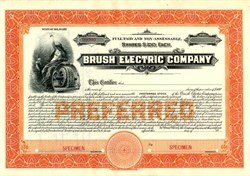 Beautiful engraved specimen certificate from the Brush Electric Company . This historic document was printed by Hamilton Bank Note Company and has an ornate border around it with a vignette of an allegorical woman next to an electric generator. 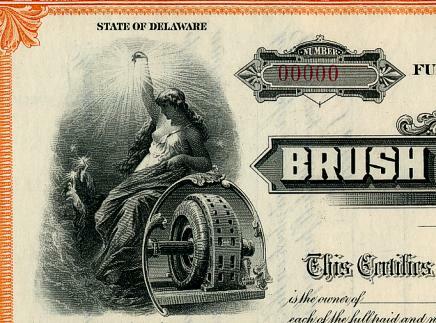 The Brush Electric Company was incorporated in Delaware in 1912 as successor to the Brush Electric Light & Power Company. The Brush Electric Company was a subsidiary to the Cities Service Company.